HORAN Capital Advisors Blog: Is The Value Style Outperformance Sustainable? Until the market's (S&P 500 Index) recent rebound from the February 11, 2016 low, investors have essentially gone two years with flat returns in stocks. Certainly it has not been a market that has just traded sideways, but one with significant volatility, both up and down. 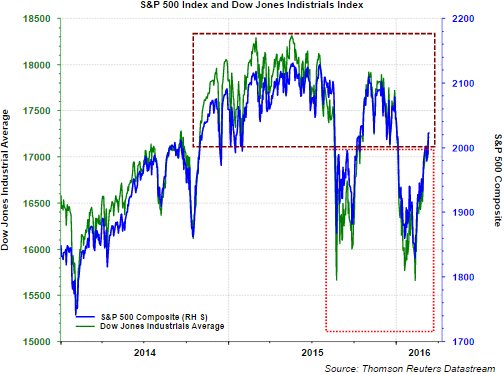 The most recent recovery has pushed the S&P 500 Index back into the trading range in place since late 2014. Technically, this recent rally into the higher range opens up the potential for the Dow to move to the top of this higher range, 18,300 and the S&P 500, 2,130. Contributing to the improved equity market since the February bottom has been the strength in value and cyclically oriented sectors: energy, financials and industrials. As the below chart shows, energy is up 15.8%, financials are up 14.4% and industrials are up 11%. 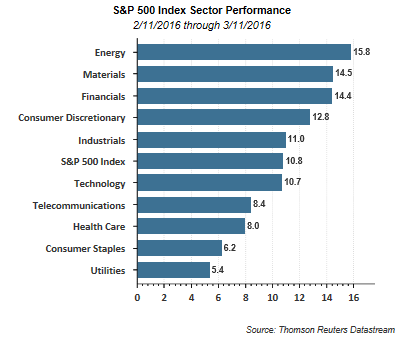 These three sectors are more heavily weighted in the value oriented indices like the iShares S&P 500 Value Index (IVE). Financials account for over 25% of the value index versus an 8% weighting in the growth index (IVW). Energy represents 12% of the value index versus only 1% in the growth index. The improvement in the value segments of the market has led to the large value index outperforming its large growth counterpart since the February bottom and so far in all of 2016. One reason investors should consider maintaining a written record of their thoughts around their market decisions is the ability to go back and review the outcome of those decisions. 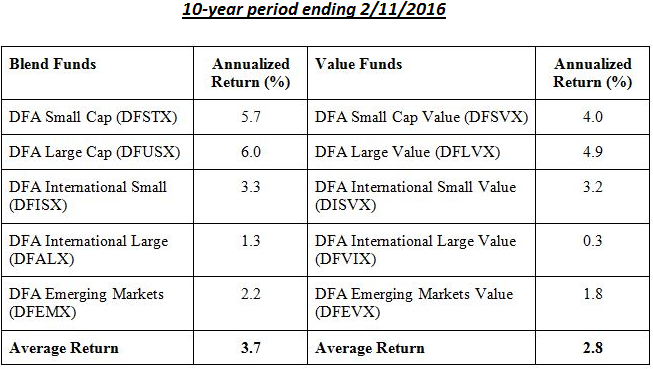 With respect to this value/growth phenomenon taking place in 2016, the market went through a similar adjustment in early 2014. I wrote a post on March 26, 2014, almost exactly two years ago, Why It Matters That Value Stocks Are Outperforming Growth Stocks. 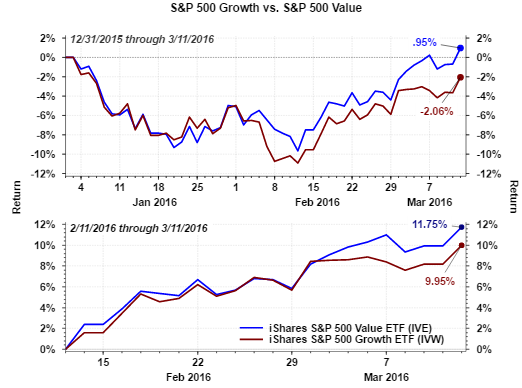 Subsequent to that post, and for the following two years, growth actually outperformed value. One factor I noted in the 2014 post was value would outperform if economic activity was strengthening. What actually occurred though was a peak in GDP growth at 4.6% in Q2 2014 which declined to 2.1% in Q4 2014 and .6 in Q1 2015. In fact, economic growth weakened and growth resumed leadership until the beginning of this year. "Total year-on-year industrial production also remains in the negative column, at minus 0.7 percent, a disappointment but a contrast to manufacturing where the year-on-year rate is modest but accelerating, at plus 1.2 percent." 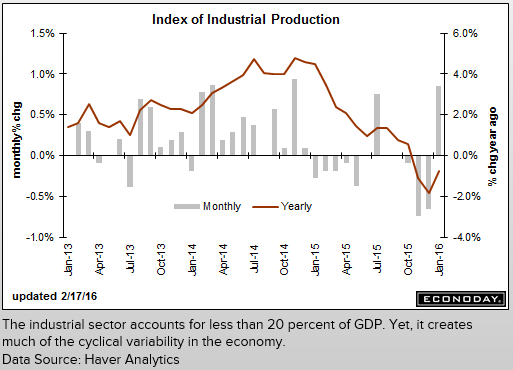 "A negative in the report is a downward revision to December, to minus 0.7 percent from minus 0.4 percent. But the revision doesn't take much away from the January surprise where strength, based in manufacturing and underscoring January's rise in retail auto sales, should help ease concern over the economy's first-quarter performance." As seen in the sector chart earlier in this post, energy and financials have been strong performers in this value rebound. Energy related stocks have seen an improvement due to the increase in oil prices into the high $38/BBL area from the mid $20/BBL reached on February 11th. I am not convinced this rally in oil is sustainable given the continued oversupply in the oil market. Lastly, both large and small value have outperformed the S&P 500 Index on a long term basis going back to 1927. 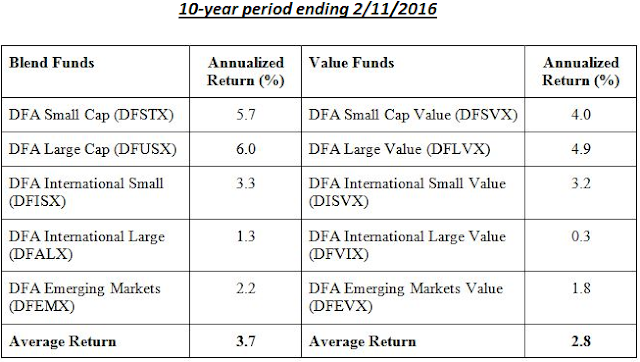 Of late though, value has lagged its blended index counterparts over the last 10-year time period as can be seen in the below chart. The takeaway for investors is the risk of going all in or all out of any one style. One can invest in the blended index of course, or simply tilting one's allocation between growth or value may be a better approach. With that said, maybe a tilt towards value is an opportunity at this point in time. The one caution is the much higher weighting in energy within the value index and the anticipated volatility in energy prices.